This example is a basic implementation of Real-Time Polygonal-Light Shading with Linearly Transformed Cosines. Three lights are displayed, each with different orientation and parameters. Roughness, metallness and $ f_0 $ can be also configured through the UI. This example was originally contributed by Jonathan Hale. 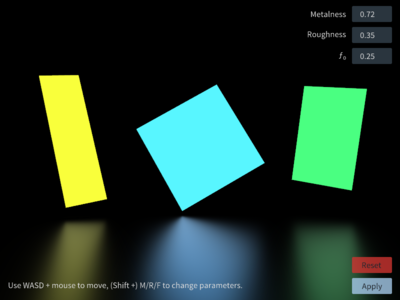 The implementation is based on the paper "Real-Time Polygonal-Light Shading with Linearly Transformed Cosines" by Eric Heitz, Jonathan Dupuy, Stephen Hill and David Neubelt. The *.dds files are republished with a permission from Eric Heitz. There's also a Guest Post introducing this example on the Magnum Blog. The example makes use of the Adobe Source Sans Pro font through the Ui library, see its documentation for license information. The ports branch contains additional patches for Emscripten and OpenGL ES support that aren't present in master in order to keep the example code as simple as possible.